We can’t really point to anything specific, but your kid seems really special. Maybe it’s his adorable mop of hair, or the precocious social skills that helped him the attention of Queen Amidala. Maybe it’s the fact that he’s just 9 years old, yet he’s already crafted a working protocol droid and pod racer out of spare parts. Maybe it’s his reckless courage, or his unparalleled skills as a pilot. Yeah, it’s really hard to say what makes him remarkable! But something tells us he might even be the one in the ancient prophecies, the one who’s supposed to bring balance to the Force! Just to be on the safe side, you might want to get him some formal training. And we know the perfect Jedi Master for the job—he’s just got to take care of this creepy Sith on Naboo and then he’ll be right over to take your son to the temple. While you’re waiting, you might want to let the little guy know what’s going on. The path of the Jedi isn’t easy, but the hardest part always seems to be leaving your home and family behind. So be gentle! Hey, we don’t want to get ahead of ourselves, but why don’t let him try on this Deluxe Anakin Skywalker Costume? It’s got a lot of fun details, like a 3D molded belt, a black faux leather stole, and matching boot covers. That should cheer him up! And you’ll feel better knowing that he’ll have everything he needs to succeed in his studies. Looks NOTHING like picture. I do not understand how companies get away with such blatant false advertising. Costume was ripped. The only accessory that comes with it has to be altered to fit any kid because it is so big. 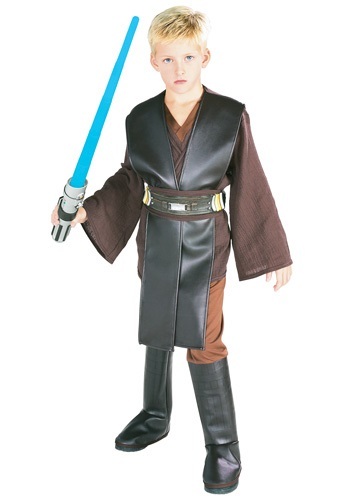 My son did not believe this was the same costume that he wanted. I DO NOT RECOMMEND THIS IN ANY WAY.